Richmond Park is a 955 hectares (9.55 km2; 3.69 sq mi) urban park within London. Almost three times as large as New York City's Central Park, it is Britain's largest urban walled park, and the largest of the Royal Parks in London. It is close to Richmond, Ham, Kingston upon Thames, Wimbledon, Roehampton and East Sheen. 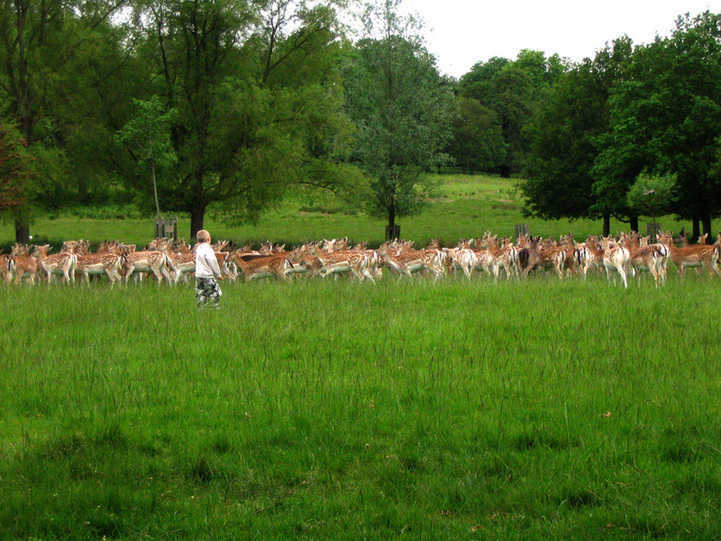 The park is famous for its red and fallow deer, which number over six hundred. The Isabella Plantation is an important and attractive woodland garden. There is a protected view of St Paul's Cathedral from King Henry VIII's Mound, and a view of the central London's London Eye, Natwest Tower and 'The Gherkin', appearing to be in close proximity to each other. The Park contains notable buildings, ten of which, plus the whole wall of the park, are listed buildings. Pembroke Lodge and some associated houses stand in their own garden within the park. Pembroke Lodge was originally a home of 1st Earl Russell, and is now a restaurant. The Royal Ballet School has been based for many years at White Lodge where younger ballet students continue to be trained. It was originally a hunting lodge for George I. There are four other houses, apart from the gate-houses: Thatched House Lodge, Holly Lodge (formerly Bog Lodge), White Ash Lodge and Oak Lodge. Holly Lodge contains a visitors’ centre (bookings only), the Park's administrative headquarters and a base for the Metropolitan Police's Royal Parks Operational Command Unit. Looking west from King Henry's Mound. King Henry VIII's Mound is the highest point within the park and is located within the public gardens of Pembroke Lodge. It is named after Henry VIII of England. There is speculation that the mound has an older history, and may have originally been a barrow. From the Mound there is a protected view of St Paul's Cathedral in the City of London over 10 miles (16 km) to the east which was established in 1710. (A telescope is installed on the mound, for a better viewing experience.) This vista is protected by a 'dome and half' width of sky on either side. The Mayor of London (Ken Livingstone) sought to overturn this protection in 2005, and reduce it to 'half a dome'. No final decision is yet public. To the west is a panorama of the Thames Valley. The park's open slopes and woods are based on lowland acid soils. The grassland is mostly managed by grazing. The park contains numerous woods and copses, some created with donations from members of the public. One such area is the Isabella Plantation, a stunning woodland garden which was created after World War II from an existing woodland, and is organically run, resulting in a rich flora and fauna. It is a major visitor attraction in its own right. Another is Queen Mother's Copse, a small triangular enclosure on the woodland hill halfway between Robin Hood Gate and Ham Gate, established in memory of the late Queen Elizabeth, the Queen Mother. Another is Two Storms Wood, a short distance into the park from Sheen Gate. (Some extremely old trees can be seen inside this enclosure). Another is Bone Copse which was named in 2005. It was started by the Bone family in 1988 by purchasing and planting a tree from the Park authorities in memory of Bessie Bone who died in that year. Trees have been added annually, and in 1994 her husband Frederick Bone also died. The annual planting has been continued by their children. Richmond Park is a Site of Special Scientific Interest, a National Nature Reserve and a Special Area of Conservation for the Stag beetle. Herds of red and fallow deer roam freely within much of the park. A cull takes place each November to ensure numbers can be sustained. Many of the deer in Richmond Park are infected with a bacterium called Borrelia burgdorferi which can be transmitted to humans through a tic bite causing Lyme disease. Borrelia burgdorferi belong to a group of bacteria known as spirochetes which cause a number of diseases worldwide, including syphilis, leptospirosis, relapsing fever and Lyme disease. It is an important refuge for other wildlife, including woodpeckers, squirrels, rabbits, stag beetles, insects plus numerous ancient trees, and varieties of fungi. Richmond Park supports a large population of what are believed to be Ring-necked (or Rose-ringed) Parakeets. These bred from birds that escaped or were freed from captivity. During King Edward's (1272–1307) reign the area was known as the Manor of Sheen. The name was changed to Richmond during Henry VII's reign. In 1625 Charles I brought his court to Richmond Palace to escape the plague in London and turned it into a park for red and fallow deer. His decision, in 1637, to enclose the land was not popular with the local residents, but he did allow pedestrians the right of way. To this day the walls remain, although they have been partially rebuilt and reinforced, and Richmond remains the smallest National Park in the UK. In 1847 Pembroke Lodge became the home of the then Prime Minister, Lord John Russell and was later the childhood home of his grandson, Bertrand Russell. It is now a popular restaurant with glorious views across the Thames Valley. All houses backing on to the park pay a feudal fee known euphemistically as “Richmond Park Freebord” ranging from about £2 to £200 per annum. The park is enclosed by a high wall with several gates. The gates either allow pedestrian access only, or allow both vehicular and pedestrian access. The gates for vehicular access are open only during daylight hours, and the speed limit is 20 mph. No commercial vehicles apart from taxis are allowed. The gates open to motor traffic are: Sheen Gate, Richmond Gate, Ham Gate, Kingston Gate, and Roehampton Gate. Robin Hood Gate (close to the Robin Hood roundabout on the A3) was closed in 2003 as part of a traffic reduction trial and will stay permanently closed. There is pedestrian access to the park 24 hours a day except when there is a deer cull. This means it is not uncommon to find cyclists, walkers and runners using the park at all times of the day and night. During the deer cull the majority of the gates are locked and warning signs are displayed forbidding access to the park under the orders of The Secretary of State. Warning signs are normally displayed a month before the deer cull occurs. The park has designated bridleways and cycle paths. These are shown on maps and noticeboards displayed near the main entrances, along with other regulations that govern use of the park. The bridleways are special in that they are for horses (and their riders) only and not open to other users like normal bridleways. This is rarely a problem as the sandy surface discourages anyone not on horseback. Most riding is done through organized stables which, in general, obey the rules about where they can ride. The 1997 law limits cycling to: (a) main roads; (b) the hard yellow cycle path that runs around the park (Tamsin Trail); and (c) other hard (i.e. concrete or cement) surfaces. Cycling along the park's mud paths is forbidden as contrary to the park's bye-laws. Until 2005 the park was policed by the separate Royal Parks Constabulary but that has now been subsumed into the Royal Parks Operational Command Unit of the Metropolitan Police. In recent years the mounted policemen have been replaced by a patrol team in a four-wheel drive vehicle. Most users respect the rules, but there are occasional abuses. The most frequent offenders are motorists and speed cyclists who fail to observe the 20 mph limit. At busy times motorists can be seen parking outside the designated car parks or driving off the roads. Recreational cyclists can be a problem: some mountain bikers are tempted to ride away from the designated cycle paths. As with other Royal Parks, the use of barbecues and the lighting of other fires is illegal. The playing of radios or other musical equipment is also not allowed. Commercial photography requires permission. The park has disabled access and many of the gates have toilet facilities next to them. There is also a children's playground next to Petersham Pedestrian gate. As the park is an area of special scientific interest and a Nature Reserve, all dog owners are required to keep their dogs under control while in the park. This includes not allowing their dog to disturb other park users or disrupt wildlife Unfortunately some dog owners have allowed their animals to disturb wildlife leading to the death of wild fowl, so from 2009 the park's dogs on leads policy has been extended. It is also common to come across dog owners and dogs playing with dead wood. Dog owners have been asked not to do this as this wood has been purposely left for the park's beetles. the Wards of Canbury, Coombe Hill, Coombe Vale and Tudor in the Royal Borough of Kingston upon Thames. The present MP is Susan Kramer, a Liberal Democrat. Where is Richmond Park located ? The park is open from 7am in the summer and 7.30am in the winter, and closes at dusk all year round. A document giving specific opening and closing times for the whole year can be downloaded here. Richmond Park, originally a deer-hunting park, still has 300 Red Deer and 350 fallow deer. The deer have played a major role in the Park's history and have shaped the landscape too. Our special grassland habitat depends on grazing and the parkland trees have a distinctive 'browse line' as the deer eat all the leaves and twigs growing below about 1.5 metres. Deer grazing also prevents tree seedlings from growing, keeping the grassland open. For young trees to survive they need to be protected against damage from deer antlers for some 50 years. During the autumn the deer 'rut' (breeding season) takes place. The red stags and fallow bucks compete for females (known as hinds and does respectively). At this time, the large males roar, bark and clash antlers in a spectacular way in an attempt to fight off rivals and to attract as many females as possible. The young are born mainly in June, and are hidden by their mothers amongst the bracken and long grass. Females and their young are very vulnerable and sensitive to disturbance at this time. The deer are wild animals, so never try to touch or feed them. Always keep a respectful distance, especially if you have a dog. The Isabella Plantation is now an ornamental woodland garden, full of exotic plants, that is designed to be interesting all year round. But its name suggests a far humbler origin. In the 17 th century, this area in the south west corner of Richmond Park was known as The Sleyt. This is the name usually used for boggy ground or an open space between woods or banks. By 1771, it is shown on maps as Isabella Slade . Isabella may have been the wife or daughter of a member of staff. But it is more likely to be a corruption of the word isabel, which was used as far back as the 15th century to mean dingy or greyish yellow - the colour of the soil in this part of the park. In 1831, Lord Sidmouth, the park deputy ranger, fenced off 17ha (42 acres) of the Isabella Slade . He planted oak, beech and sweet chestnut trees as a crop for timber and gave the area the name it has today. The present garden of clearings, ponds and streams was established from the 1950s onwards. It is largely the work of George Thomson , the park superintendent from 1951-1971. Along with his head gardener, Wally Miller, he removed Rhododendron ponticum from large areas and replaced it with other rhododendron species. They established evergreen Kurume Azaleas around the Still Pond and planted other exotic shrub and tree species. The main stream through the garden from Broomfield Gate was dug in 1960 and the plantation was enlarged to include Peg's Pond. More recently, in 1989, a wild stream was dug in the northern section and this has now been colonized by ferns, water plantains and brook lime. The Bog Garden was reconstructed in 2000. The garden now has 15 known varieties of deciduous azalea and houses the national collection of 50 Kurume Azaelas, introduced to the west around 1920 by the plant collector, Ernest Wilson . There are also 50 different species of rhododendron and 120 hybrids. In spring, visitors can see camellias, magnolias, as well as daffodils and bluebells. From late April, the azaleas and rhododendrons are in flower. In summer, there are displays of Japanese irises and day lilies. By autumn, guelder rose, rowan and spindle trees are loaded with berries and leaves on the acer trees are turning red. Even in winter, the gardens have scent and colour. There are early camellias and rhododendron, as well as mahonia, winter-flowering heathers and stinking hellebore. Isabella Plantation is now run on organic principles. Its luscious ground cover and mature trees make good habitat for wildlife and it is part of the Richmond Park Site of Special Scientific Interest. It is a particularly good place to see birds. Resident species include redpoll, bullfinch, wood pecker, sparrow hawk and tawny owl. There are water fowl, such as pintail, tufted duck and pochard. Visiting birds include: wood warbler, redstart and whitethroat in spring; blackcap and spotted flycatcher in summer, green sandpiper in autumn and siskin and reed bunting in winter. Richmond Park is the largest Royal Park in London covering an area of 2,500 acres. From its heights there is an uninterrupted view of St Paul's Cathedral, 12 miles away. Richmond Park has changed little over the centuries and although it is surrounded by human habitation, the varied landscape of hills, woodland gardens and grasslands set among ancient trees abound in wild life. The royal connections to this park probably go back further than any of the others, beginning with Edward (1272-1307), when the area was known as the Manor of Sheen. The name was changed to Richmond during Henry VII's reign. In 1625 Charles I brought his court to Richmond Palace to escape the plague in London and turned it into a park for red and fallow deer. His decision, in 1637, to enclose the land was not popular with the local residents, but he did allow pedestrians the right of way. To this day the walls remain, although they have been partially rebuilt and reinforced. The Isabella Plantation is a stunning woodland garden which was created after World War II from an existing woodland, and is organically run, resulting in a rich flora and fauna. Richmond Park has been designated as a Site of Special Scientific Interest and a National Nature Reserve. Hunting created Richmond Park and deer continue to shape the way it looks. Royalty had taken a close interest in the Richmond area from the late 15th century when King Henry Vll built a palace in the Manor of Sheen. Henry and his successors hunted in the neighbourhood. But it was a visit to Richmond by King Charles I in 1625 that turned this area of medieval farms and pasture into a royal park. Charles was escaping from an outbreak of plague in London. He realised that Richmond gave him the best opportunities for hunting near London. The area included open grassland with individual oaks - some of which were mature trees at the time of Charles' visit and are still standing. There were also small farms and common land where local people had a right to graze cattle or collect timber. Charles ignored all these claims on the land and, in 1637, he created a hunting park. He introduced around 2,000 deer, and to make sure they didn't stray he built a brick wall eight miles long, which you can still see today. Local people were furious about the King's action. He was forced to pay compensation to some landowners and had to restore the right of people to walk in the park and collect firewood by installing a ladder in the wall. From then on, deer and hunting began to change the appearance of the park. Deer grazed the leaves and bark of young trees and stopped the open grassy areas turning into woods. Ancient trackways and field boundaries disappeared as the grassland developed. Large established trees were pollarded (cut regularly at about 3 metres from the ground). This technique encouraged the trees to grow straight tall branches that were suitable for timber and also protected them from browsing deer. Even today, the lowest branches of trees in the park are all about the same height from the ground - just out of a deer's reach. In the second half of the 17th century, King Charles II spent over £3,000 on repairs. He created new ponds for the deer to drink from and gave permission for gravel to be dug in the park. In the 18th century, two planned vistas were created to show important guests the best views of the park and beyond. One looked down to the grand avenue of Queen's Ride to White Lodge, a hunting lodge built for King George l. The other looked out from King Henry's Mound - a high point, said to have used by Henry Vlll to watch hunting. You can still stand here and look down a specially-maintained avenue in Sidmouth Wood across London to St Paul's Cathedral. Few other changes were made in Richmond Park. Pen Ponds, a lake divided in two by a causeway, was dug in 1746 and is now a good place to see water birds. In the 19th century, several small woods were added. These include Sidmouth Wood and the ornamental Isabella Plantation, both of which are fenced to keep the deer out. Also in the 19th Century people were no longer given the right to remove firewood, which is still true to this day, to help in preserving the park. Change happens slowly and maps made in Victorian times still make sense here. The park has 2 shire horses named Billy and Massey. A wide range of sports are available in the Park, from informal kickabouts to horse-riding to club rugby. At weekends and during holiday periods, the Park frequently attracts visitors for informal sports. For many, the extent of sporting activity during their visit is limited to a kickabout with a football or a game of French cricket before or after a picnic. For others, the attraction is the network of roads and designated paths for cycling. In season, the wooded areas and hill climbs in the Park offer unrivalled opportunities this close to Central London for orienteering and cross-country running. The park is open from 7am in the summer, and 7.30am in winter, closing at dusk all year round. Call +44 (0)20 8948 3209 for more information. Perhaps you'd like to play a game of rugby. A section of the grassland to the north of the Roehampton Gate is maintained and laid out for rugby and accommodates 3 adult pitches. At weekends, this area is hired extensively to Rosslyn Park Rugby Football Club. The club buses visiting teams to and from the park pitches from its nearby clubhouse and changing rooms. There are opportunities for horse riding in the park through a number of local stables. If you prefer to provide your own propulsion, Richmond Park offers an interesting and varied cycling experience, from the flattest roads to hilly climbs for the more dedicated pedal pusher. Cycle hire is available from 10.00am to 4.00pm Monday to Friday and 9.00am to 6.00pm Weekends. The hire shop is located in the car park near Roehampton Gate. For more information and booking, please contact Sterling Concessions on 07050 209249. Photo ID is required to hire bikes. Pen Ponds, 16 June - 14 March by paid permit available from Holly Lodge. Concessions for children and pensioners. Call +44 (0)20 8948 3209 for more information. There are two 18-hole courses, used for both 'pay and play' and for golf clubs and societies. There is a 16-bay driving range and a large pro shop (+44 (0)20 8876 3205). Call +44 (0)20 8876 1795 for information and booking. Children's play area at Kingston and Petersham gates. Summer holiday entertainment at Petersham gate playground at the gate gardens. Or call +44 (0)20 8948 3209 for further information. A section of the grassland to the north of the Roehampton Gate is maintained and laid out with 3 adult pitches (winter only). This area is hired to Rosslyn Park Rugby Football Club. If you are interested in playing, please contact the club directly on +44 (0)20 8876 6044 - NB There are no facilities for changing or showering on site. Welcome to Bound's fitness to feel good about. The weekly x-Training & Outdoor Gym and Running & Circuit Training sessions will have you looking and feeling your best - all year round. Suitable for all fitness levels, equipment and water provided. Fancy a go? Click here and register now for your FREE Trial class! All sessions are based on the key principles from our New You Boot Camp programmes and include: Parade, Section Attacks, Command Tasks, Battle PT, Leopard Crawling, Log Runs, Body Pump, Boxing, Skipping, Team Games, Scramble Net-Obstacle Courses, Circuit Training and Core Training. (Please note that some activities may be cancelled due to bad weather or staff skill). NYBC Fitness Days cost less than two hours with your personal trainer! So you get six hours of training for the price of two with our world class military trainers! So whether you are a past New You Boot Camper or someone who wants to train the New You Boot Camp way, this is for you! Training days are open to both male and females. Be pulled along by a kite while sitting in a kite buggy or standing on a landboard. This fast growing sport is taught by qualified instructors year round in the grassy spaces of Richmond Park. For more information, please visit the Kitevibe website at www.kitevibe.com or call +44 (0) 20 7870 7700 or +44 (0) 7866 430 979. Condition your pelvic floor so you can sneeze with ease! Serves a range of snacks, drinks and ice creams, indoor and outdoor seating. A beautiful Georgian mansion set in 13 acres of landscaped grounds with spectacular view. The Lodge has a banqueting facility for up to 130 people, supported by a car park and disabled access. There is a garden with seating, and the Lodge is licensed for alcohol. Children are catered for, and high chairs and baby change can be provided. Serving a wide a range of hot and cold snacks and beverages. From bacon rolls to freshly brewed coffee, ice cream to biscotti. How to get to Richmond park, london ? This is an open exhibition and explores whay and how contemporary artists approach famous artworks - the perceived ‘masterpieces’ of art history. Works question notions of ‘originality’ and ‘authenticity.’ The exhibition includes meticulous exact copies in oil to radical reworkings in different or incongruous media. Artists copy, quote or reference past works for a number of reasons. For some, it is the continuation of the academic tradition of learning through copying, the challenge to equal or perfect a renowned work, while for others it is commercial - creating popular souvenirs for a lucrative consumer market. Some of the artists included pay reverent, respectful ‘homages’ to artists who have had a profound impact on their work, while others create playful postmodern pastiches imitating and subverting the familiar style of an artist. Please note that the admission is Free. 1. "pedestrian access" "richmond park" ? Ans : Click here to view pedestrian access richmond park.